Harry Potter and the Escape from Gringotts is an excellent motion base ride in The Wizarding World of Harry Potter - Diagon Alley and one of the best attractions at Universal Studios Florida. The minimum height to ride is 42 inches. 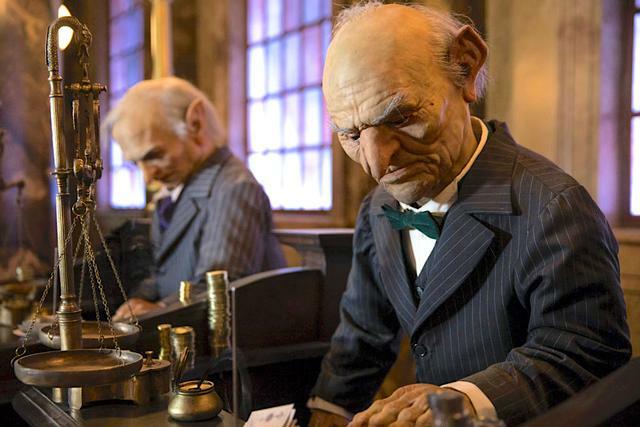 You are visiting Gringotts Bank to meet with Bill Weasley and tour the underground vaults before opening your own Gringotts account. However, you just happen to be visiting on the same day that Harry, Ron, and Hermoine have disguised themselves to break into Bellatrix Lestrange’s vault, from Harry Potter and the Deathly Hallows. Before your tour can begin, Bellatrix finds you and attacks, soon to be joined by Voldemort. Will you ever escape from the “safest place on Earth”? A hybrid of roller coaster and motion-base ride systems, coupled with 3D filmed scenes and practical effects, Escape from Gringotts features filmed performances from Helena Bonham Carter, Ralph Finnes, and Domhnall Gleeson, who reprised their roles as Bellatrix, Voldemort, and Bill Weasley, respectively, for this ride. Amazing ride which is extra fun to ride with someone that's never been on it. The beginning part is simply awesome! Wonderful and elite attraction. The waiting line is one of the greatest ever made. By the time you load the ride vehicle you feel like you are deep within the vault. The only minor nitpick I have is that I was hoping a bit more thrilling. That is why I rate The Mummy a touch better. But still, this is amazing and also has some of the best "curb appeal" of any ride ever made. An amazing achievement that puts you inside a moment from the films, but from a perspective you never saw in the films or books. It's not especially a "thrill" ride, but it includes some nifty physical moments. I love it. Fun ride, especially if you are a Harry Potter fan and know the storyline this ride is presenting from the books/movies. If you don't know the story, it is quite confusing to follow but it is still a fun dark ride/coaster. Forbidden Journey is better suited story-wise for people less familiar with Harry Potter.